Know the warriors. As the treatise in the title advises: "If you know both yourself and your enemy, you can win a hundred battles without jeopardy." Before play begins, players should review their character sheets; the GM should study those and the bad guys' abilities. Know where to find combat skills, active defenses (Dodge, Parry, Block), and stats for weapons, shields, and armor. If somebody has combat-related traits (or just traits you're unsure about! ), read up on those in Adventurers (for delvers) or Monsters (for their foes). Casters should be familiar with their favorite magic in Spells – mid-battle isn't the time to realize that, say, casting a Missile spell isn't the same as attacking with it. Control the battlefield. The GM should prepare a combat map (Exploits, pp. 27-28) in advance for each fight. If the battlefield features hazards or obstacles, key these to the adventure notes. If reusing an erasable battle map instead of drafting multiple maps, keep small maps handy on hex paper (or bookmark those in a published adventure) so you can quickly sketch them. Similar advice holds for figures: Have them ready and note which ones represent which fighters – and if you have duplicates, differentiate them (if only by attaching colored paperclips). Learn the flow. A key concept to internalize is that combatants act in the order of the combat turn sequence (Exploits, p. 28). On your fighter's turn, pick a maneuver from those listed on pp. 28-33 of Exploits. This dictates allowed movement, actions (readying gear, attacking, spellcasting, etc. ), and active defenses. Take your movement – remembering that facing and footing matter (Exploits, pp. 33-35), and that you rarely get your full Move unless you do nothing but move – and then perform your actions. Then your turn ends and the next person in the sequence acts . . . though your maneuver governs your defenses until it's your turn again. There's no "master" turn during which everyone acts; turns are individual and sequential. Count down a duration (e.g., of a spell or smoke cloud) on the turn of whoever triggered the effect. Have an answer. Combat goes faster when everybody is ready with their choice of maneuver, movement, and actions. Pay attention to what's happening. Use the time when others are taking their turns to plan a fitting course of action you can embark on without hesitation when your turn arrives. Consider making a "cheat sheet" of your favorite moves, noting the rolls involved, applicable modifiers, and page numbers of special rules. ATTACK: Decide how you're attacking. Your target must be in reach of a melee weapon, in range of a ranged one. Find your skill level, apply any situational modifiers (like penalties for tricky moves, difficult combat conditions, and – for all ranged attacks – distance), and roll 3d. A roll less than or equal to modified skill means you may hit. DEFENSE: Your target decides which active defense to use, applies any modifiers (notably bonuses for a shield or retreating, and penalties for posture, facing, or stun), and rolls 3d. A roll less than or equal to modified defense prevents the hit. EFFECTS: If your blow lands, roll your attack's damage dice and subtract your victim's DR to learn whether you cause injury. Damage type modifies the injury amount (Exploits, p. 53). Guaranteed effects of injury are HP loss and (unless your foe has High Pain Threshold) shock. Knockback, reduced movement, or crippling might happen if you do enough damage. Stun, unconsciousness, and death depend on further rolls. Thus, attacks can miss, be avoided, or not penetrate DR – and whittling HP down to 0 doesn't guarantee victory, only that your victim is rolling dice not to lose. Use GM discretion. The GM can keep the game moving in other ways. Handle hordes of identical foes in bulk: They all act at the same point in the combat sequence, they move en masse (push their entire formation across the map at once), and they take the same maneuver. To keep things interesting, one or two can do something clever (like exploit a delver's screw-up) or straggle behind (due to injuries). Make judicious use of "And Stay Down!" (Exploits, p. 86); setting injury limits past which a monster counts as beaten means not managing as many combatants for as long. Having lesser monsters drop after a major wound or reaching 0 HP is a real time-saver! Ease into the details. There are always special cases; e.g., movement can come before or after an attack, making an All-Out Attack or being hit from behind means having no defense, and there's no roll to avoid defeat at -5×HP (instant death) or for fodder who reach the GM's preferred injury limit. The game also gets fussier whenever many modifiers from pp. 95-100 of Exploits apply. Spells bend countless rules. 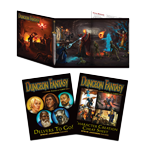 The Dungeon Fantasy GM Screen and game aids on the back covers of Character Creation Cheat Sheet, Delvers to Go!, Exploits, and Monsters can help, but you'll want to learn this stuff. Until you do, don't sweat it if you overlook something. As GM, don't change reality retroactively to fix errors, because that slows things down – say, "Oops, we'll get it right next time!" Keep the action moving. Forget what you know. About other games, that is. 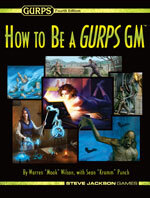 There are RPGs that do have a master turn, or where an "initiative roll" shuffles the combat sequence . . . that ignore facing, posture, and distance . . . where 0 HP means death . . . where a turn is so long that it makes sense to ready a weapon and take a full move and attack, or to reload and shoot a crossbow. You'll have to unlearn all that! Still having trouble? 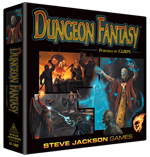 The Dungeon Fantasy Roleplaying Game is based on GURPS, so the detailed combat advice in How to Be a GURPS GM – and its author's combat examples – should prove helpful!